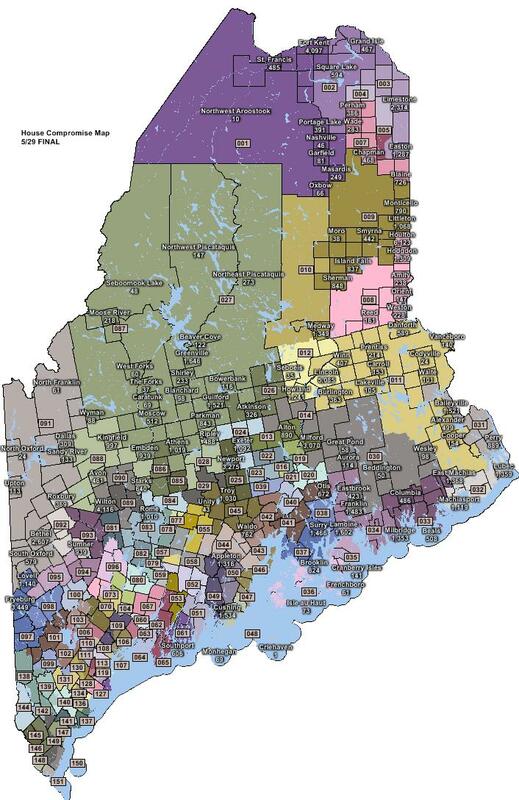 A bipartisan commission appointed to redraw Legislative district lines on Friday unanimously approved a compromise map for the Maine House of Representatives. The vote follows unanimous approval of a compromise map for the State Senate and county maps last Friday. The ideal House district size is 8,797 people, while the ideal Senate district is 37,953. 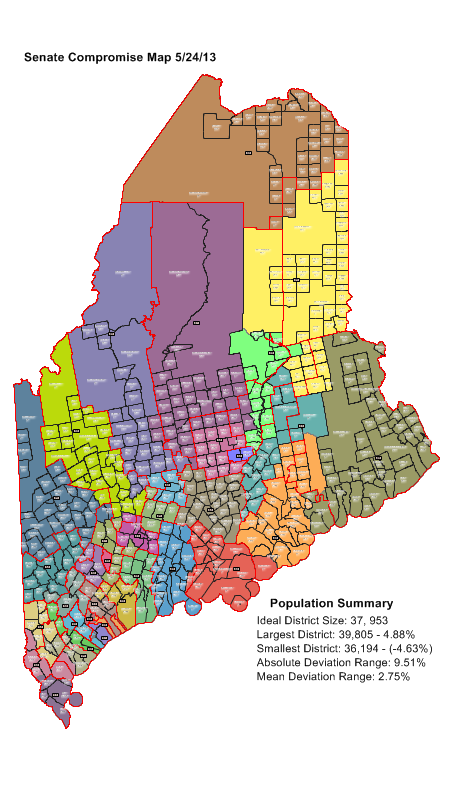 The 151 House districts and the 35 Senate districts are all within plus or minus 5 percent of that ideal population size. The Maine Constitution requires the plan to be approved by a two-thirds vote of the legislature by June 11. If a two-thirds vote cannot be achieved, redistricting proposals are sent to the State Supreme Judicial Court for resolution. Reactions of some lawmakers who served on the committee are below. The maps face further votes in the House and Senate. Democratic legislators urged their Republican colleagues on Wednesday to “delay tax breaks for the wealthy” as a means of helping balance the budget and avoid property tax hikes. The unfunded tax breaks, passed two years ago, were championed by Governor Paul LePage and the 125th GOP-controlled Legislature. 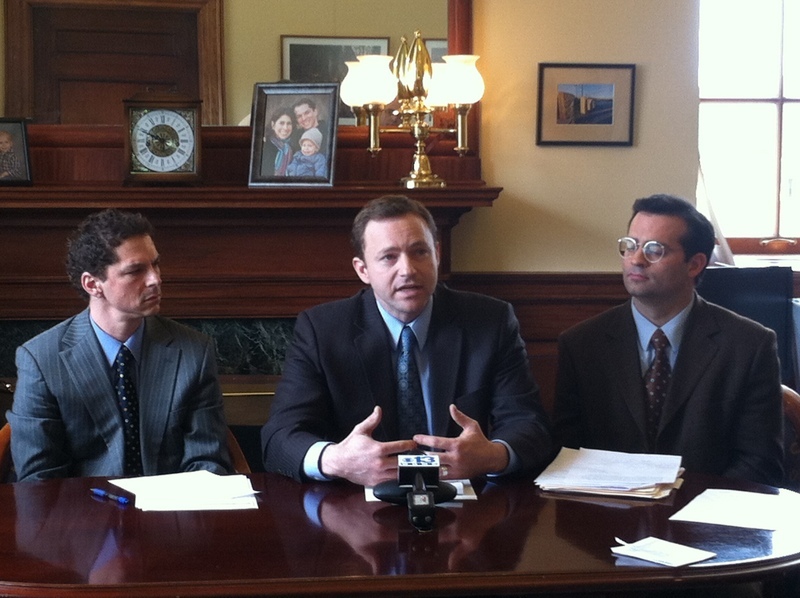 Speaker Eves takes question from media, as Governor LePage’s office broadcasts overhead a message of “No New Taxes”. 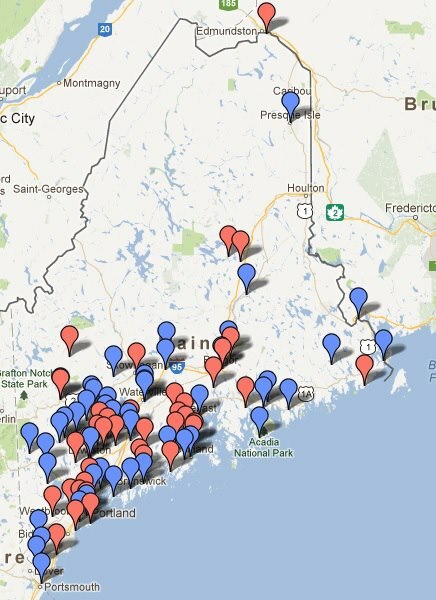 More than 60 towns and school districts have signed resolutions against the LePage budget. 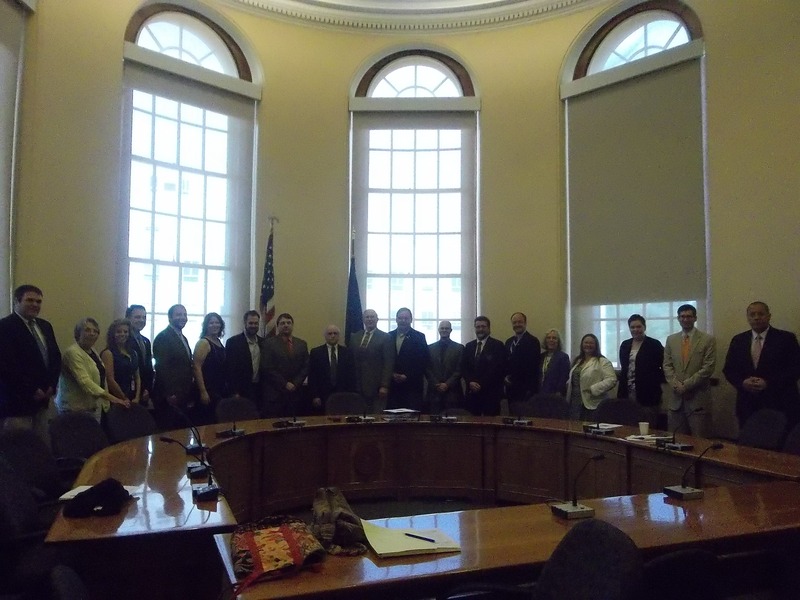 The Maine Municipal Association says the LePage budget is a $424 million shift to municipalities and property taxpayers. Delaying the entire tax cut, including the income tax and estate tax changes, would restore more than $400 million in revenues. Delaying the tax breaks was recommended by the Taxation Committee (PDF) after months of public hearings on the budget and tax proposals. The tax cuts passed in 2011 provides the top one percent, those earning more than $350,000 per year, a tax cut of almost $3,000, while middle income families will see a return of a little more than $100, according to the Maine Center for Economic Policy. The old saying, that you “can put lipstick on a pig, but it is still a pig” is certainly true in Augusta with Democrats in control. They are up to the same old tactics they have been practicing for 40 plus years, and the Maine Republican Party is speaking out. In a letter to the Appropriations Committee, the Democrat controlled taxation committee has proposed putting some new lipstick on the same old pig and trying to trick you into thinking they have new ideas. They don’t. The letter contains a heavy dose of rhetoric for a legislative committee, as well as recommendations for a massive middle class tax hike. In short, Democrats have just said that they don’t care about pro-growth tax reform, they don’t care about middle class Maine people, they don’t care about Maine’s small businesses, and they don’t care about making government more affordable. In fact, all they do care about is taking as much of your money as possible, and taking it as quickly and efficiently as possible. If that means putting new lipstick on the same old pig, that’s what they’re going to do, and it’s what they just did. Included in the budget is a provision that would raise the retirement age of public workers from 62 to 65, cut Maine’s prescription drug and health coverage for working parents program, end $400 of property tax relief for more than 75,000 middle-income Maine households, and freeze cost of living adjustments for state employee retirees — which already provides a meager average pension of only $18,500 per year. Yet at the same time, LePage is pushing through hundreds of millions of dollars of tax cuts. While most Mainers will receive a tax cut under the governor’s plan, the lion’s share of the cuts will go to the wealthiest of state residents. UPDATED 5/29/13: Total now stands at 80 communities and schools. AUGUSTA – Hoping to encourage municipal officials to offer solutions about the upcoming biennial budget proposal, Governor Paul R. LePage today released a letter to city and town officials. The Governor acknowledges in the letter the opposition many mayors, city managers and selectmen have against his budget plan, and he admits it is not a budget he enjoyed putting forward. In the letter, the Governor attached total general fund appropriations for Fiscal Year 2014-15, which shows the bulk of the budget – 44.8 percent – allocated to education. The Department of Health and Human Services uses 35.2 percent, and the remainder of State government accounts for 20 percent of general fund spending. Regardless of whether Governor LePage’s proposed cuts are ultimately implemented, Republicans believe local government must participate in making government at all levels more efficient. Governor LePage also extended an offer to assist town and city officials if they need flexibility from the State to reduce their own budgets. “If there are proposals to reduce administration and overhead by sharing services between towns, we will support them,” he said. 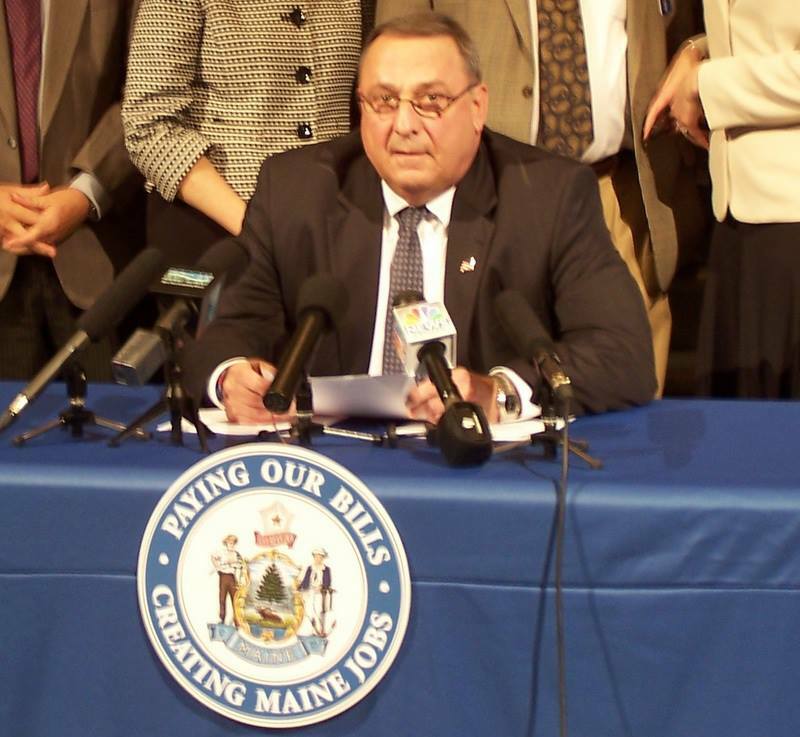 During a 2009 city council meeting, a foul-mouthed Mayor Paul LePage attacked then-Gov. Baldacci for “sticking it to the property taxpayers” when a recession-induced revenue collapse forced across-the-board budget cuts. Gov. LePage is now proposing an even greater tax shift that favors rich Mainers at the expense of Maine’s middle class. Originally, the intention was to simply share the various clips taken of the LD 1546, “An Act To Strengthen Maine’s Hospitals, Increase Access to Health Care and Provide for a New Spirits Contract” floor debates in the Senate and House as stand-alone posts without comment. Then a funny thing happened: in reviewing them, a clear separation of messaging became apparent between the members of the GOP in the Senate and the Governor’s “Office Du Jour” (see: Washington Post, Huffington Post, Talking Points Memo). Consistent GOP themes: LD 1546 is “Washington Politics”, “Welfare expansion”, myriad concerns over costs and having to hire either 83 new people (per Senator Mason) or 93 new people (per Senator Thibodeau) and general distrust of the federal government. In short, everything Maine rejected from this party in the November election results. Perhaps some of the greater moments of irony came at the 1:20 mark, when Senator Mason claimed that the bill’s creation and process was “rude and disrespectful” of the VLA Committee and then further comments (2:00) that LD 1546 “was ram-rodded through”. Um… anyone else remember LD 1333/ PL 90 from the 125th Legislative session? When Republicans openly admitted that they had not even read the bill? The bill that really WAS “ramrodded through”? 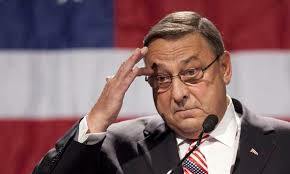 Republicans also claimed that it would pay for Maine’s 133,000 uninsured citizens and lower insurance costs. Um- not so much. “Linking these two bills together that have nothing to do with one another is just what people complain about when they see it happening in Washington. Unfortunately, that kind of strong-arm politics has migrated north. An ongoing “negotiation” since last July that has gotten Maine nowhere… nor this past March, when the Governor demanded a ten year waiver rather than three- something no other state has been granted by the federal government. In fact, Maine is no closer that it was in February 2012. Not exactly working to close the deal but rather putting off as long as he can. Summary: Senator Hamper is concerned with the costs, especially in light of the reported DHHS shortfalls, inabilities to pay their bills past June 12th and budget projections for FY 14-15. Yet he urges that Maine not “rush through” with Medicaid expansion. Shame that the Governor thinks that “The Administration has not been entertained”– and is now putting an unilateral gag order onto any within his administration that would go before the Appropriations committee to speak regarding the proposed budget and that he and he alone will be the one to speak to the committee. “Charlie Brown’s football being hauled away by Lucy”. Um, okay. Not even gonna touch this one. Interesting… and contrary to what Governor LePage said when he vetoed LD 1546. “Democrat leadership has spent the past week forcing this bill through the legislative process, over the objections of Republicans and Democrats alike. This unadulterated partisanship tied two different issues together in a quest to force welfare expansion upon the Maine people. I have said all along this bill would receive a veto when it reached my desk, so this letter should be no surprise. Assistant Minority Leader Thibodeau, same as Rep. Ken Fredette would do later in the House, attempts to delay the vote with a series of procedural questions regarding the bill’s formation and combining of separate elements. Senate President, as Speaker of the House Eves would also do later in the session the next evening, explained his ruling. Thibodeau then speaks, first complaining on timelines elapsing in what he feels is a premature time frame, and then referring to items that the Democrats claimed were ramrodded through in the 125th Legislature. And at the 5:10 mark, Thibodeau echos the phrase “Washington style politics”. Oh wait… one of them was from the PPH article. Maybe we’ll get lucky with the next speaker. Well, well! Add another senator who thinks (0:40) that expanding Medicaid is a good thing! 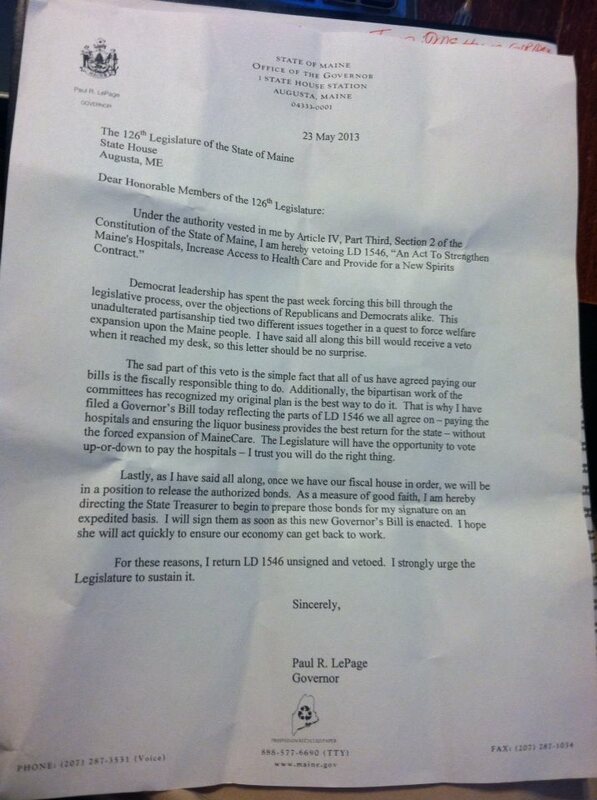 His issues are similar to Senator Langley’s in that he would prefer the bills be examined and worked upon separately. We even get a bonus, just to be sure (2:20)! Okay, there it is. BINGO! 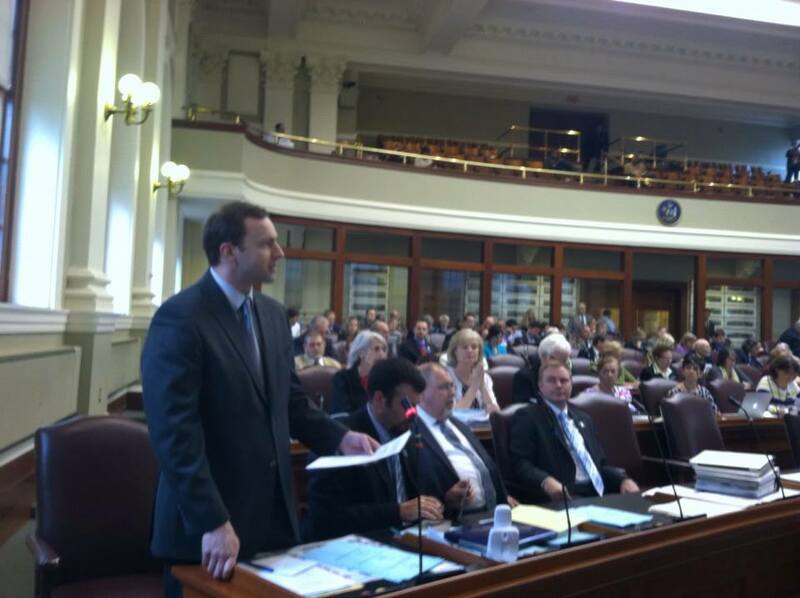 House Speaker Mark Eves, D-North Berwick, condemned the move on Friday, while a LePage spokeswoman said it should not affect the committee’s work and the administration will provide all necessary information to lawmakers. Wow. Someone in the Executive branch seems to have some difficulty with understanding how Maine’s co-equal 3 branches of government as per our state’s Constitution works, ie, Article III, that “Executive = Legislative = Judicial”, let alone that his role in the process DOES have limits in power. But, this is hardly news to anyone around Augusta… and now hardly news to the Feds as well. 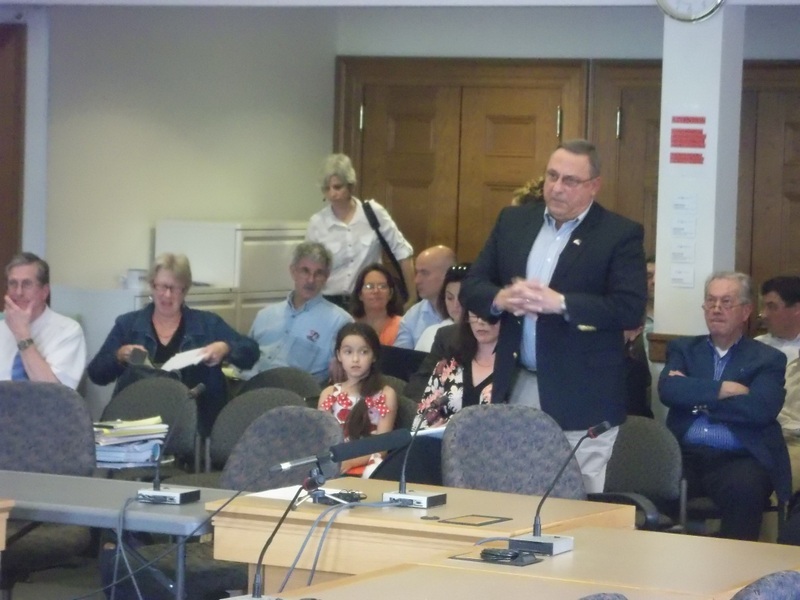 AUGUSTA – Governor Paul R. LePage released a statement today after the Appropriations and Financial Affairs Committee refused to let him speak at an emergency meeting held Sunday to discuss a shortfall in welfare spending. 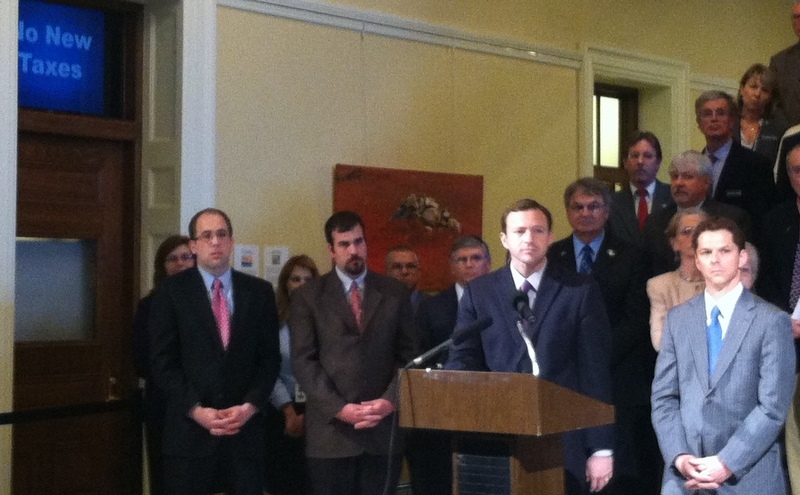 “Leadership has shown that it does not care about Maine taxpayers. 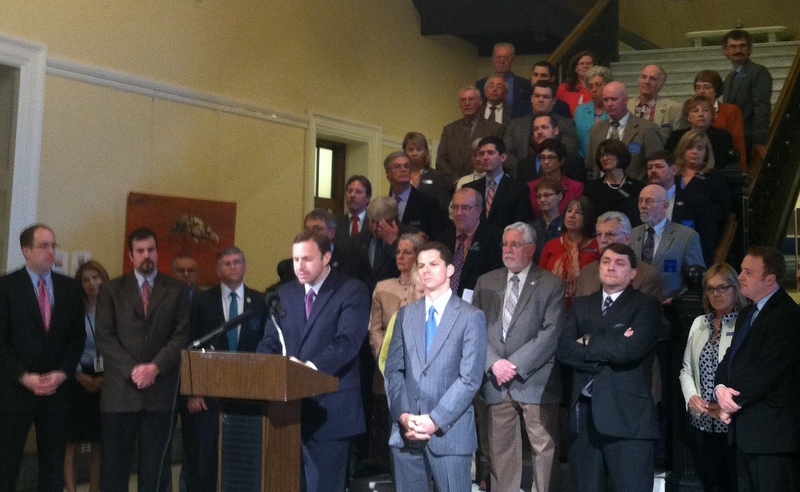 They are determined to grow government, expand welfare and raise taxes on hard-working Mainers to pay for it all. As your Governor, I will not raise taxes. And I am not going to shut down government. That is up to the legislature. Here again is the video clip of Governor LePage attempting to interrupt the concluded first portion of Sunday’s Appropriations Committee work session. Now, here is where it gets interesting- at what point “had the Administration not been entertained”, as the Governor claimed on Sunday? Or does he really see himself- and ONLY himself– as “The Administration”?? And here is the testimony of Commissioner Millett- so add another 21:33 to the tally. One doesn’t have to be a member of Appropriations to work these numbers! Both commissioners were allowed as much time as they wanted to use; at no point were either restricted from speaking freely to the committee. Want a second source? Well, probably not the best available, but there was my first UStream recording attempt; there are 3 clips here for review, starting at 1:44 pm and concluding just past 3pm. The last one (45:40) captures not just the conclusion of Mary Mayhew’s testimony and all of Sawin Millett’s but also (and arguably most importantly) what exactly transpired at the conclusion of that portion of the work session between AFA Chair Senator Dawn Hill and Governor LePage. 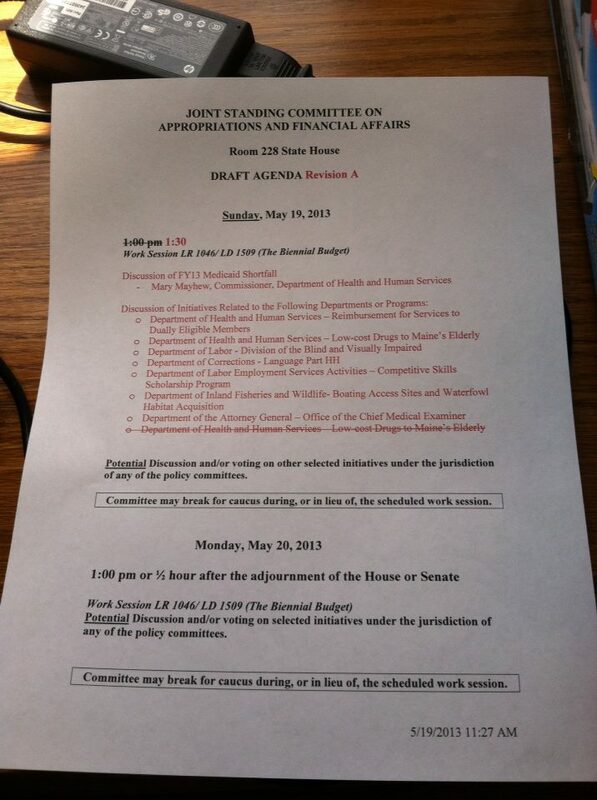 It is clear- the work session agenda item focusing on FY13 Medicaid Shortfall had concluded. The Governor tried to inject himself into the legislative portion of the budget process. And unlike the last time he did so in January 2012, this time he was correctly denied the opportunity to do so. 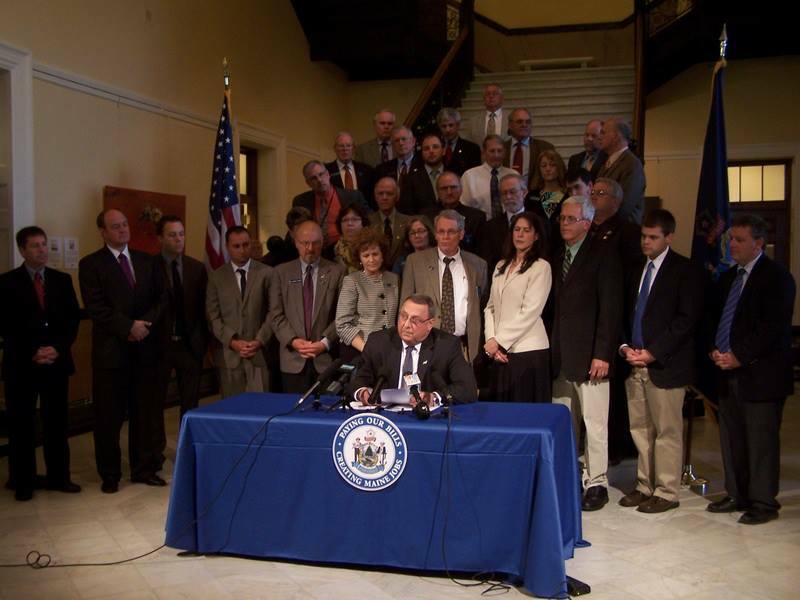 At a Hall of Flags ceremony surrounded by GOP legislators, Governor LePage on Thursday signed the letter to veto LD 1546, characterizing LD 1546, “An Act to Strengthen Maine Hospitals, Increase Access to Health Care and Provide for a New Spirits Contract,” as “tied payment of the hospital debt to welfare expansion” and then announced plans to reintroduce his own bill in its place. Press secretary Adrienne Bennett provided copies to the press of the letter the Governor read. The Governor also directed the State Treasurer to prepare the voter-authorized bonds for his signature. 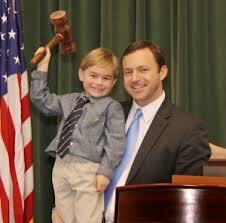 “I will sign them as soon as this new Governor’s Bill is enacted,” the Governor stated.